Highly nutritious, this gift of health and goodness makes a well appreciated gift for those who have fallen under the weather. 6 bottles of Brands Essence of Chicken 70cl and 6 bottles of Brands Essence of Chicken with Cordyceps 70cl. Nutritious essence comes with cheery Holland Daisies. Same-day delivery services available for delivery within Klang Valley only for order made before 12pm on a working day. 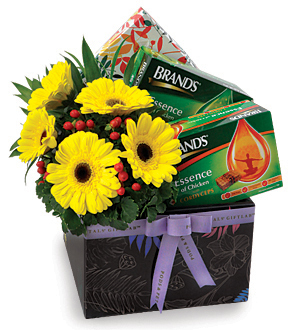 For other States, fresh flowers may be subjected to change depending on availability or may be changed to non fragile food item if courier is required. Call 03-78830233 / 012-6915200 for more details.